From 9 to 18 July 2018, the High Level Political Forum (HLPF) on Sustainable Development met at the United Nations Headquarters in New York City. Member States, together with other agencies and actors, affirmed political leadership and reviewed global progress towards the achievement of the SDGs. Following the theme "Transformation towards sustainable and resilient societies", we used this important occasion to highlight the role of forests and forest products in achieving the SDGs. 16 July: Launch of "Made in Forests"
Michelle Yeoh, actress, UNDP Goodwill Ambassador, and sustainable fashion champion, opened the Ministerial Segment on 16 July, and launched the video "Made in Forests", a short story on sustainable fashion. Read the full press release here. A fashion exhibit brought together the work of many designers, all inspired to use forest-derived materials for their creations. Participants learned more about the connection between forests, fashion and the SDGs by exploring the 'SDG cubes'. 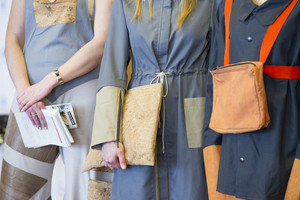 Beyond this exhibit, have a look in your wardrobe - perhaps you too are wearing forest solutions! Find pictures of the exhibition at the UNECE-FAO flickr account. Read the related news release here. A reception with distinguished guests celebrated the highlights of the exhibition on 16 July in the East Lounge (Qatar Lounge) at the UN Headquarters. Along with opening remarks by high-level invitees, guests had the chance to talk to the designers and representatives of all organizations that were involved in the 'Forests for Fashion' collaboration. 10 July 2018: Side event "UN Partnership for Sustainable Fashion and the SDGs"
The UN is committed to changing the path of fashion, reducing its negative social, economic and environmental impact and turning it into a driver for the implementation of the Sustainable Development Goals (SDGs). During a side event “UN Partnership on Sustainable Fashion and the SDGs” held at the High Level Political Forum on Sustainable Development (HLPF) on 10 July 2018, in New York, 10 different UN organizations agreed to establish a UN Alliance on Sustainable Fashion. UN Environment took a bold step in agreeing to host the Alliance during its first year, and formally launch it at their next Environment Assembly in March 2019. The Alliance also aims to reach out to wider audiences, targeting the private sector, governments of UN member States, NGOs and other relevant stakeholders with a unified voice. Read the full press release here.